As usual the following pictures are just to offer the readers the personal emotions of a protester like yours truly. Far better images and videos can be now found about Venezuela since its repression has become so noteworthy. Below, just my day. It started raining so I was afraid that it would be a bust. But even late, people came in numbers, in huge numbers. Because of the rain I could not find a team that I could join, everyone´s schedule was amiss. In the end I went on my own, parking my car at the CCCT mal and walking for, oh, 5 hours? I went up to the Francisco de Miranda gathering point where with the crowds I found these nuns in perfect anti Maduro gear. The crowds, patiently waiting, were already significant, more than I expected, worthy of a major march day. It has been a month of protest and spirits are far from down. 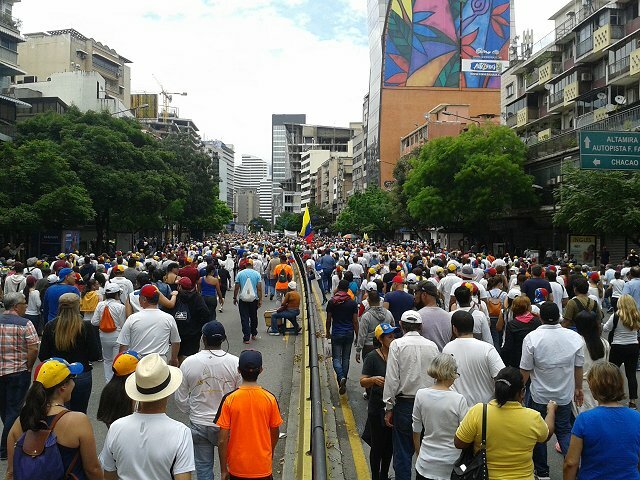 After about an hour wait, loitering in the street there was finally a mass movement towards Altamira, East, contrary to the expected direction of the march, West. 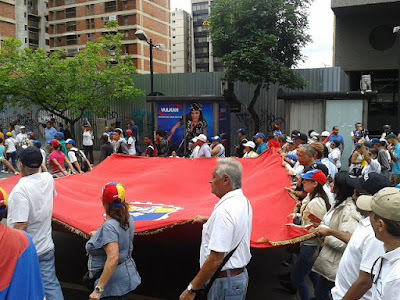 By the way, let's not forget that it was Labor Day in Venezuela and the old Unions are reviving, courtesy of the regime and its sold out trade unions. I eventually reached the speaker stand. It was so packed that I had to struggle to reach a point were I could take this panoramic view. For fun you may observe Wendy's first floor packed with people watching. During the speeches people got impatient and wanted to march and yelled it so. So the pols had to accept, speed up and reveal the new march route: up North and then West to the High Court rather than the announced original straight line West route. This is what the opposition does now, it gave up on requesting march permits from the regime, permits that are never given anyway. It got tired of being blocked anyway by an army of tear gas throwing goons. So now, the general goals are stated a day in advance but the final route is revealed as the march starts. 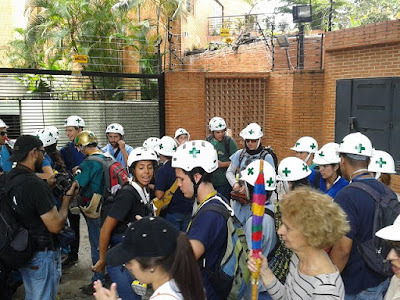 So up the La Castellana we went, walking all the way uphill to the Cota Mil avenue where we would supposedly turn left to bypass already installed blockades in the Miranda avenue. Of course, no one truly thought we would even make it to the Cota Mil. One month teaches you a lot. From the video above you may have guessed that the irony was that I would be at the head of the march which started on my left. And indeed I was in the first blocks of marchers. But luckily as I was doing pics and pics I was left behind enough that I did not get to smell the tear gas later. But I am getting ahead. Two short videos to give you an idea of the flow of people going up. However I made a series of discoveries this time around. Since the massive protests started in April, for personal reasons I have not been able to attend them (health, mine and the SO, huge work problems, etc). I did attend the April 19 of course and I wrote about it. Today I also felt that I could not miss. But all in all I have been missing a dozen or so activities and thus today I discovered how the opposition is starting to get organized against the dictatorship, taking the first steps to create its own militia, a first tiny but significant step towards a civil war if the regime persists in its stubbornness. But don't all dictatorships do the same? This video was simply a staggering moment for me. I heard a big rumor while I was walking up hill. By the time I turned back I realized that it was a squadron of, well, "freedom fighters". The youth of Caracas has learned to fight and to get organized. What you see is the mere tail end of one of those groups that went by me, albeit the bigger one I saw. Others were smaller , or simply two or three kids together. Observe how they are dressed, all skin protected, gas masks, water and assorted protection, back pack, etc... Rudimentary perhaps but this how it all starts, in Damascus or Kiev. They run together, holding each other, just as they will hold each other during an attack when visibility goes down. I was aghast, and that was not all, There are also the white helmets with green crosses. These kids have organized themselves so well that they even have a rescue team that picks up those that are injured! Look at them, most were not ten years old when Chavez was elected president!!!! The failure of a regime is in that picture. And I have a video too, where they do not run like crazy. Those are the sensible ones, those with a mission, those that will need to keep their temple as they pick up their comrades down. And they walked as such. And then came the end of the walk. Suddenly people slowed down and I started hearing "thuds" and "thumps" in the distance. The attack had started, the Nazional Guard had started its descent from the Cota Mil with a massive throw of tear gas in what is a residential area. Too bad for any resident in its home. I was already too far behind for a good picture but I tried nevertheless. Here is a cut from the best I took, and then a video which at least will show a couple of grey streaks, when the canisters are launched. Not on video but I also saw the actual flame of the throw. down the avenue. Everybody in awe or taking pictures. The only option the crowd had was a side street that supposedly was going to take us to the next exit of the Cota Mil, as if the guard would not be waiting for us there.... But I went for what was going to be another trap, one that I escaped because somewhere along the way I had twisted my knee. It was a long walk back and I needed to preserve my knee and energy since there is, as you can guess, no cabs or any public transportation working at such time. 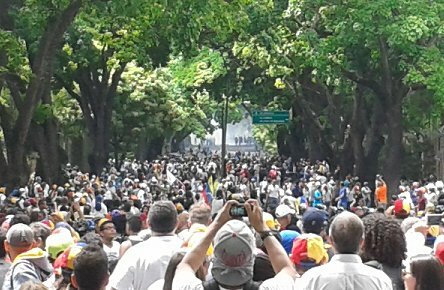 So I went down through small streets back to the CCCT while the side march went to meet its fate close to Pedregal, where colectivos and Guards dosed them abundantly with tear gas. It was a long trek back but I made it without much trouble though I was in some lone streets where I though about possible squads of colectivos for whom I would have made an easy target to rob. But I digress again. The moment of tension came as I was reaching the central highway crossing point to go over the to the CCCT. Just as we arrived we saw smoke billowing from under the bridge. We all stopped. After a minute or so we started going slowly realizing that it was more of a burning thing than tear gas. The point is that the central highway was without cars, run back and forth by bikers that we did not know what side they truly were. So I hurried to cross but had to round up the CCCT as all doors had been closed except one of parking access. Safely in I indulged on a lunch of empanadas and shake of "tomate de arbol". Little did I know that mayhem was starting outside. By the time I left I did smell something but I was on my car and off I went. I learned later that 15 minutes after me leaving my brother and his family had been cornered accidentally on the highway and my sister in law almost fainted and fell to the ground, with a charitable soul lending her his gas mask until she could recover enough to stand up and make a run of it. Unfortunately you only learn of other people positions and aventures after the fact since all cell phone communications collapse due to the heavy use. So you do not know what happens two hundred yards from you and cannot wait, go for help, to help or anything of the sort. My conclusion for the day? We are at pre civil war levels. I saw it. With my own eyes. From the organized youth to the resolve of the people. Checking before going to bed I find this tweet on the battle ground in front of the CCCT that I avoided by 30-40 minutes, I think. Two tips: 1. Buy a cheap bike, put it in your vehicle, and park uphill from the Tolon shopping center, say next to the florist's shop. That area is fairly safe because it's close to the embassies. Take your bike and go towards McDonald's on Las Mercedes. If it's open you can use it to order something and do a pit stop. 2. 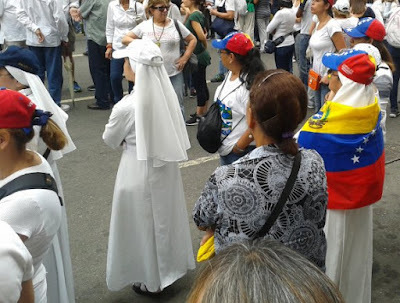 Yesterday I saw about 18 National Police walking towards the east into Chapellin (they were on the Andres Bello side, about four blocks from the church). Chapellin is a fairly upscale barrio, and the local youth was enthusiastically throwing stones at the cops, who responded with tear gas. Eventually the protesters receded into the barrio, the cops marched forward, and one of them started lobbing tear gas towards the barrio. This tells me crossing Chapellin from East to West is going to be fairly easy. That crossing is about 500 meters. So the key is to get access to Chapellin's East side. That involves going across private property which has a gorgeous lawn, but it's only fenced with a very regular fence I'm sure is easy to cut with wire cutters. I know the owners and I'm sure they'll look the other way if you go uphill from the Centro Lido, crossing Francisco de Miranda and entering the street that, after about 100 meters, takes you alongside that property with the nice lawn. The trick is to push uphill along that street, fill it with protesters for about 500-600 meters of street. Then take out cutters and breach the fence in several spots, cross the lawn, cut the western fence, and get into Chapellin. If you make it to the church at Andres Bello you will be in Libertador. I expect they'll block the exits out of Chapellin, but I've only seen very small fairly poorly armed police contingents in that sector (I lived a few blocks away and have been getting a fairly good view of what's going on). So the question is whether the marchers will have the disposition to walk through the tear gas and rush past 18 cops who by then will probably be calling on colectivos and firing grenades at point blank straight into the crowd? Maybe you want to copy this to the Pope so he can put it in the Vatican library, so history will record what he did to Venezuela? That report was awesome, and great to see so many brave soles out protesting, knowing what the regime is capable of. Yourself included Daniel. I have said it on here a few times now that every dictator in Venezuela has been over turned by the youth and they appearing to be organizing again. You can bet that many of those police/national guards will soon find their kids throwing stones at them and that is when the army falls apart. A bipartisan group of U.S. Senators introduced a wide-ranging bill Wednesday aimed at the crisis in Venezuela, calling for sanctions and demanding President Donald Trump step in to prevent a deal struck by Venezuela's state oil company that might lead to Russian ownership of U.S. oil. The bill calls for the State Department to coordinate an international response to the crisis in Venezuela; requires the U.S. intelligence community to prepare an unclassified report on the involvement of Venezuelan government officials in corruption and the drug trade; and would provide $10 million in humanitarian aid for the country. Food shortage and triple-digit inflation in Venezuela have led to weeks of violent protests against President Nicolás Maduro. In addition, a section of the bill highlights a Nov. 30 loan given by Russia's state-owned oil company, Rosneft, to Venezuela's state-owned oil company PDVSA. The deal would allow the Russian company to take control of nearly half of the U.S. oil company Citgo, which PDVSA owns, if Venezuela defaults on its debts. he deal would potentially give Rosneft a 49.9 percent minority stake in Citgo, but other transactions could tip the Russian company into owning a majority of the company. The senators also expressed concerns that Russia could use its control of Citgo to counter sanctions imposed by the Obama administration after Russia annexed the Ukrainian territory of Crimea in March 2014. Excellent report about the situation. Picture &1000 Words Department: Instapundit: This is not Braveheart or 300... It's the people of #Venezuela facing off against the failed regime of Hugo Chávez & Nicolás Maduro. The Trump administration is monitoring Venezuelan instability, and believes there is a strong need to bring weeks of anti-government protests in the country's capital Caracas to a quick and peaceful conclusion. H.R. McMaster, U.S. President Donald Trump's national security adviser, met on Friday with Julio Borges, the president of Venezuela's opposition-led National Assembly, about the civil unrest which has been near-daily for five weeks, the White House said on Saturday. They discussed "the need for the government to adhere to the Venezuelan Constitution, release political prisoners, respect the National Assembly, and hold free and democratic elections," White House press secretary Sean Spicer said in a statement to Reuters. “Some of the acts there have been deplorable and [it's] certainly something that we’re monitoring very closely,” White House spokeswoman Sarah Huckabee Sanders told reporters on Friday, according to Reuters. According to the Associated Press, clashes between police and protesters have left 38 dead in the past month. Local news media on Friday carried a video circulating on Twitter of a statue of the late President Hugo Chavez being pulled down. The media reported that students destroyed the statue as they vented their anger with the food shortages, inflation and spiraling crime that have come to define life in the South American nation. The protest movement has drawn masses of people into the street nearly every day since March, and shows no sign of slowing. According to Reuters, embattled Venezuelan President Nicolas Maduro on Monday announced the creation of a new popular assembly which demonstrators decried as a power grab aimed at sidelining the National Assembly. Borges responded by calling on Venezuelans to rebel. “We are deeply concerned about the Maduro government’s violent crackdown on protestors in Venezuela. President Maduro’s disregard for the fundamental rights of his own people has heightened the political and economic crisis in the country,” said Nikki Haley, the U.S. Ambassador to the United Nations in a statement. “The Maduro regime must respect Venezuela’s constitution and the voice of its people. We are particularly concerned that the government is failing to provide basic food and medical needs to the Venezuelan people,” Haley said. Hey Daniel, are you OK?